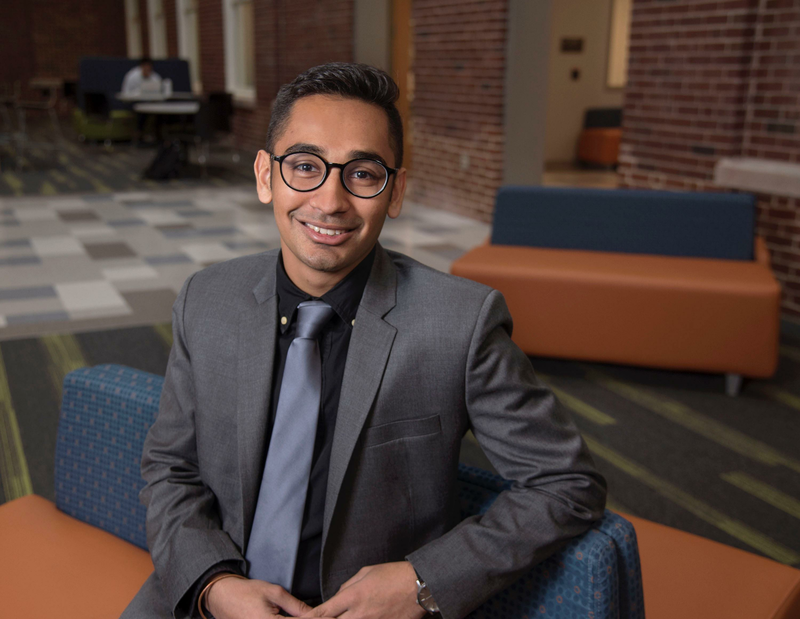 Bioengineering senior Shrey Maheshwari was among the nine students selected as 2019 Knights of St. Patrick, a College of Engineering distinction that recognizes leadership, excellence in character, and exceptional contributions to the college and its students. "The Bioengineering Department is very proud of Shrey, and we are eager to see where his skills and wonderful personality take him," said Maddie Darling, Bioengineering undergraduate program coordinator. "He always has a smile on his face, demonstrates strong academic skills, and is willing to help students, faculty, and staff," added Bioengineering faculty member Marcia Pool, director of undergraduate programs. "We congratulate him on this honor." Bioengineering senior Shrey Maheshwari will be inducted as a Knight of St. Patrick on March 9, 2019, along with eight other engineering students. Maheshwari has positively impacted countless students during his undergraduate career through his work with the Biomedical Engineering Society (BMES), Engineering Expo, Illinois Business Consulting, and Design for America—to name just a few organizations. As the vice president of BMES, he initiated the first healthcare entrepreneurial summit on campus in 2018, which introduced students to startup opportunities in health and medicine. He also supervised about two dozen projects that fellow members created for the annual Engineering Open House. As the information session coordinator with Engineering Expo, he helped expand this annual event into one of the largest engineering career fairs hosted by any university in the country. According to Maheshwari, the fall 2018 Expo brought together more than 450 companies and 10,000 students over two days. Specifically, Maheshwari expanded the company information session options to include the traditional event, where companies host a formal presentation in a classroom accompanied by refreshments or dinner, and a reception at a campus town restaurant, where recruiters and students meet in a less formal setting. "I'm so proud of this because the Expo helped so many students find jobs," Maheshwari said. Maheshwari's impact extends beyond the College of Engineering. As the national project leader with Design for America, a student-run campus organization that aims to solve local problems through design solutions, he worked on a wearable device prototype designed to improve women's security and safety. On March 9, Maheshwari and the other eight engineering students will be inducted into the society at the annual St. Patrick ball. When he graduates in May, Maheshwari will work at Deloitte LLP, an international consulting firm. He chose the consulting career path after volunteering with Illinois Business Consulting, the largest professionally-managed, student-run university consulting organization in the country. IBC provides students with real-world project opportunities while helping clients—from Fortune 500 firms to non-profit organizations—solve challenges and identify opportunities. "Working with IBC was an eye-opening experience for me," said Maheshwari, who originally thought he'd earn an advanced degree in bioengineering after graduating in May. "It helped me realize that I want to work at the intersection of business and engineering."